Made from the mildest plant extracts, hair laundry shampoo leaves your hair feeling super clean and shiny. It is suitable for all hair types and as it's free from any suspect chemicals, you can use it as often as you like. 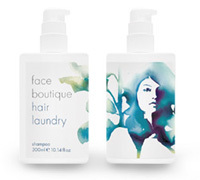 hair laundry shampoo is designed to be used with our hair laundry conditioner to make your hair extra soft. Apply to wet hair and rinse thoroughly for a fabulous shine. For a full list of ingredients, please click here. A mild shampoo formulated to leave your hair super clean and shiny.